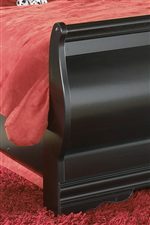 This fantastic sleigh bed features a beautiful curved headboard and footboard. The contemporary Louis Philippe design makes this attractive sleigh bed perfect for any fine bedroom. The Huey Vineyard Queen Louis Philippe Sleigh Bed by Signature Design by Ashley at Michael's Furniture Warehouse in the San Fernando & Los Angeles area. Product availability may vary. Contact us for the most current availability on this product. 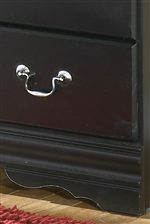 B128-98 Queen Sleigh Rails 1 62.28" 76.93" 11.18"
B128-77 Queen Sleigh Headboard 1 62.68" 7.09" 44.49"
B128-74 Queen Sleigh Footboard 1 62.83" 7.09" 28.46"